For windows version, I have already explained it here (with a nice table from wikipedia). I will add some help to Settings.ini instead with next update. Just the basics is enough. Last edited by yasitha; 14-01-2019 at 02:37. DiskSpan or normal archive? What skin you use? i do have the installer crash on me with crc and other times believe with error -11 most times its crc i use ultraarc. Also i dont use any skin. i do have the installer crash on me with crc and other times believe with error -11 most times its crc i use ultraarc. I've got a question about difference between IS_ENCHANCED and IS_UNICODE. Can I compile this script with INNO Enchanced, even if it requires INNO Unicode. If I can't do it tell me What differance does it make? I have already deleted IS_ENCHANCED in upcoming new version, so you can't compile with InnoEE anymore. Because I don't want to test around with different versions. New bugs will be in then and I don't want to mess with this things. However, I could compile a new compiler so you don't have to install Inno Unicode if you have already installed InnoEE. This happens if you partially meet the requirements. the bottom one i edited the placement just so no overlapping. also since 7.1.1beta System has been red for anything other then 1000 for windows 10 below versions will show in red and didn't happen in 7.1.0. Edit: also i had to go to post 468 with your fix their to get CustomMessages.iss, and that one was no different with the image. also did have another problem for when it was done the finish button wouldn't show and the pause button was more into the picture on finish page, but so far i haven't seen it with the 7.1.1a as of yet. Last edited by kocchi96x; 18-01-2019 at 15:16. Thanks for info. I will correct this in a hotfix. 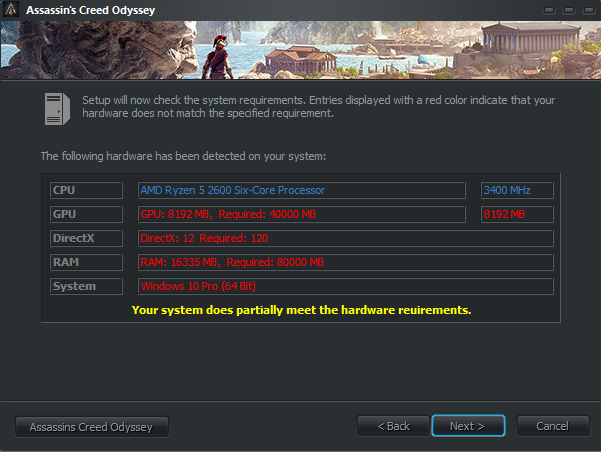 Additionaly I will add text if not all requirements are green. 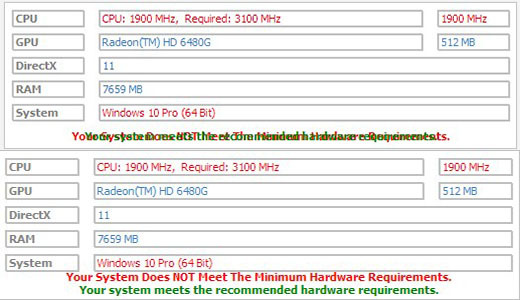 For example if only cpu mhz is below requirement and all other are OK, text says "Your system does partially meet the hardware reuirements" or something like that. Will test something out. Last edited by KaktoR; 18-01-2019 at 16:47.
just found out with the new bass.dll im not able to turn the music back on if i turn it off, when i hit the button for "Music: ON" it stays instead of going to "Music: OFF". I put the old dll back in and im able to turn it back on. I just applied the fix 7.1.1.a and I have this error message see my picture. download file from Here and get the CustomMessages.iss and copy it over. 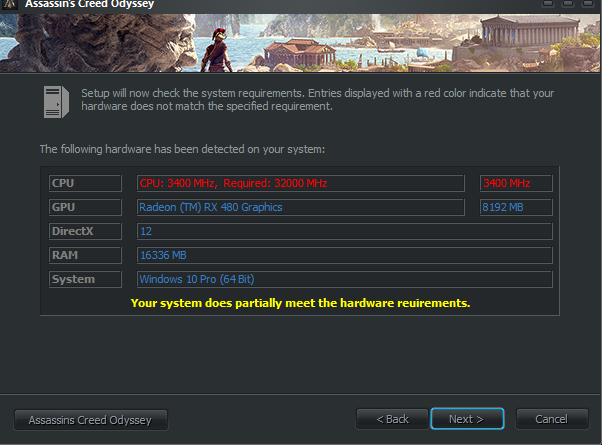 I have found two problem..
1 system requirement OS Check! but it should be green, right? Only Data.Arc can.. can you add Diskpan compatible? but can't unpack them with ASIS. If it's possible please add thia option. If it's possible. pls add those options..
Last edited by Kamalxhero; 19-01-2019 at 03:38. Make records.ini internal if you wish to not use it alongside Setup.exe (it will be extracted to %temp% folder then).